If you like Las Vegas then you like the prospects for Resorts World Las Vegas, the US$4 billion Chinese-themed destination Genting Group plans to open on the Strip from 2019. And it’s pretty hard not to like Vegas right now. Since the worst of the Great Recession in 2009, visitor volume has been growing steadily at better than 2.5% a year. At 42.3 million visitors in 2015, the city blew past its pre-recession peak by more than 3 million, setting a new record and one that could well be broken again this year based on early totals compiled by the Las Vegas Convention and Visitors Authority. For a destination where 99% of arrivals stay overnight, this is the breath of life itself. Last year, it amounted to 47.9 million total room nights occupied at an average stay of 4.4 days and 3.4 nights, the longest in four years. 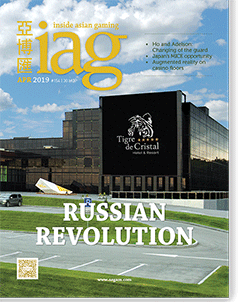 Significantly, the number of convention and trade show attendees – a critical market for the big Strip resorts – is in robust growth mode as well, up more than 13% year-on-year in 2015 amid annual growth of nearly 5% over the last six years. Hotel occupancy has bounced back to almost pre-recession highs. It reached 89.8% last year, the best since 2007. It’s at 90% currently, LVCVA numbers show. As a result, room rates are regaining ballast. Research by Macquarie Capital (USA) indicates ADR citywide last year had rebounded by 28% over 2009 and by 39% on the Strip. Through May, the ADR of US$128 citywide was ahead of last year’s by 7.5%. On the Strip it stood at $138. With the return of pricing power, revenues are ticking upward. Revenue per available room, a key measure of hotel profitability, was up 4.4% year-on-year in 2015 and is on pace to exceed that this year. The importance of this speaks for itself. MGM Resorts International operates more than 40,000 rooms alone either on or around the Strip, Caesars Entertainment has more than 23,000, Las Vegas Sands more than 7,000 and Wynn Resorts more than 4,700. There are also another 19,000 rooms spread among another dozen or so properties up and down the resort corridor. There’s still plenty of upside, too, as analysts like to point out. Macquarie analysts Chad Beynon and John Cardoso noted earlier this year that Vegas is a significant bargain compared with New York City, Chicago, San Francisco, Los Angeles or Orlando with rates still well below pre-recession highs – 12% on a nominal basis, according to their calculations, and more so when adjusted for inflation. When that happens – and it is already – the effect will be to “significantly expand margins,” they said. Moreover, the supply-demand equation will favor this momentum continuing into the next decade, everything else being equal. Lucky Dragon, an Asian-themed boutique casino slated to open on West Sahara Avenue later this year, will add around 200 rooms to the market. Resorts World is billed currently at 3,100, but it’s expected to open in phases, with possibly half that number coming online in 2019. But even factoring in the full complement – and assuming Crown Resorts’ 1,200-room Alon gets built and the stalled Fontainebleau is purchased and completed – citywide room inventory will grow by only around 5%. If anything, a lot more inventory is needed. Officials project the city will host upwards of 7 million convention delegates over the next 10 years. Mega-trade events like the Consumer Electronics Show, held at the Las Vegas Convention Center every January, say they’re already maxed out for growth unless more rooms are built. Las Vegas is back mainly because the US economy is back – not spectacularly back, but consistently, in any event. Experts predict GDP to increase by around 2% in 2016, which is in line with the last five years. Although disappointing for an economy that’s grown historically at well above 3%, the cumulative effect has been to reduce unemployment and allow households to reduce debt. Not surprisingly, personal consumption, the largest component of the economy, has bounced back. It grew at a robust 4.2% clip in the second quarter, with total retail sales up more than 3.1% in the first six months of this year over the same period in 2015. That’s not to say there aren’t concerns. Fewer adult Americans are working than at any point since the late 1970s, and in part that’s because many of them (around 2.6 million, according to The Wall Street Journal) have given up looking for jobs. This points to a lot of what is known as “long-term unemployed,” and their numbers remain abnormally high. Sluggish wage growth is also a concern. With unemployment as low as it’s been, wages should be rising at around twice the rate they are. It’s estimated that the typical salary, after taxes and other deductions, is about the same as it was 20 years ago, adjusted for inflation. In attempting to assess how all this might play out on the Strip in the next 36 months or so, maybe the first question to ask is how much of the bad news is affecting Las Vegas right now? The answer is “not much.” The economic recovery is well into its seventh year, uneven as it’s been, and it appears that the negatives aren’t intruding overly much on the lives of the core Strip tourist. Surveys commissioned yearly by the LVCVA consistently identify this individual to be a solid mid-to-upper-middle class consumer, who gambles, to be sure, but is motivated more by a desire for an inclusive resort experience. This is reflected in Las Vegas’ evolution as a destination that derives more than 60% of total revenues from non-gambling activities. On the Strip it’s closer to 70%. Genting, which is all about the mass market, couldn’t ask for a better business mix. It’s been the foundation of its success in its native Malaysia, in Singapore at Resorts World Sentosa, in Manila and in the US at Resorts World Casino New York City. To replicate this model in Las Vegas the company has secured a strong location – 87 acres at Las Vegas Boulevard and Desert Inn Road, just north of the Wynn Resorts megaresort and within walking distance of a major phased expansion of the Las Vegas Convention Center. Las Vegas-based Boyd Gaming planned to construct a megaresort called Echelon at the site but canceled it when the financial crisis hit. Genting snapped it up in 2013 for US$350 million and broke ground for Resorts World Las Vegas last May. A parking structure for 4,500 vehicles has been grafted onto some of the Echelon substructure, and plans are for this building to house 5,000 workers once construction begins in earnest, which Genting says will be later this year. The pace, obviously, has been deliberative. Money is not the issue. Genting has plenty. Reports are that an equity package valued at US$1 billion is in place to fund the first phase. But the company does have a lot of investment irons in the fire – a major expansion of its flagship Genting Highlands resort complex in Malaysia; an expansion at Resorts World NYC; casino hotels under development in South Korea, Manila and the US state of Massachusetts; and a protracted battle to develop a luxury non-gaming resort in Miami which it now appears the company may lose. It could be they are looking for partners. It could also be that the collapse of the Macau VIP market has given them some pause. High-end baccarat play, mostly from China, had carried Strip gaming revenues through most of the recession, but it has softened noticeably since. If the same factors weighing on Macau – a slowing Chinese economy coupled with a widespread government crackdown on corruption, lavish spending and illicit capital flows – are now being felt in the high-roller salons on the Strip it could be a matter of concern. It does appear the design continues to be amended. That’s not uncommon for projects of this size. Newer renderings show a gleaming red hotel tower adorned with a giant replica of a ceremonial Chinese lantern that will rise and descend along one side of the exterior. There had been talk three years ago of a live panda habitat, something elaborate by way of a replica of the Great Wall of China and a recreation of the terra cotta army of China’s first emperor. These have given way, at least in the first phase, to a “Chinese garden” overlooked by a row of restaurants and an outdoor “celestial sphere” for projecting billboard-sized selfies. The gaming floor will still be huge at 150,000 square feet and what’s interesting about this is that Genting has applied for and received Nevada licensing for a subsidiary that will develop and manufacture proprietary games and gaming concepts exclusive to Resorts World. What is certain is that when Resorts World does open, the Strip will be a dramatically different place. 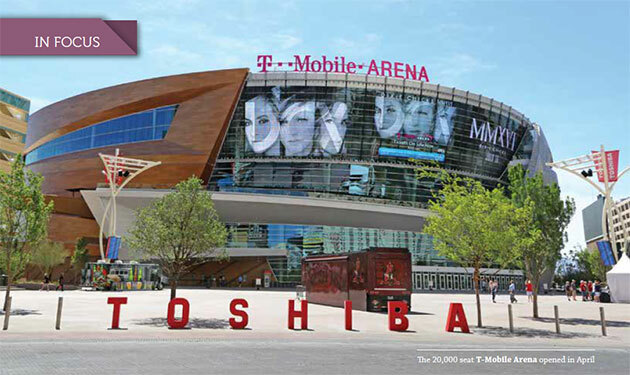 April saw the opening of the 20,000-seat T-Mobile Arena, a partnership between MGM Resorts International and entertainment conglomerate Anschütz. Located south of MGM’s City Center, the arena will be home to a National Hockey League franchise come 2017 – the first major sports team to call Las Vegas home. It could well be followed by a National Football League team if an agreement is reached on funding for a 65,000-seat stadium backed by Las Vegas Sands. The T-Mobile Arena is anchored by a sprawling outdoor gateway called The Park and MGM plans to build on these with a US$450 million reconfiguration of the neighboring Monte Carlo Las Vegas Resort and Casino into two hotels with the addition of a 5,300-seat theater scheduled to open later this year. Wynn Resorts is planning two major additions. The first, Wynn Plaza, is slated to open in the second half of 2017 and will feature 75,500 square feet of luxury retail on two levels fronting the Strip and incorporating what the company describes as a number of “interactive and experiential opportunities.” The second was unveiled at a special presentation to investors in April. It’s tentatively titled Wynn Paradise Park and will be built on the 130-acre golf course behind the Wynn-Encore complex. Plans call for a 1,000-room hotel, a casino, restaurants, nightlife and 260,000 square feet of conference and meeting space looking out onto a 38-acre lagoon with a beach and a pedestrian promenade that will host nighttime fireworks shows alongside activities like water-skiing, paddle-boarding and parasailing. Another key piece of the future stands just north and east of the Resorts World site. It’s the mammoth, unfinished Fontainebleau. It was reported in late July that buyers might be taking the 68-story hotel off Carl Icahn’s hands and that one of the partners might be the Mohegan Tribal Gaming Authority, owners of Connecticut’s Mohegan Sun, casinos in Pennsylvania and Atlantic City and a megaresort being developed near Incheon International Airport in South Korea. The Fontainebleau was an instant landmark when it arrived on the Strip in 2007, bringing with it a US$3 billion price tag and a luxury offering that seemed perfectly in tune with the exuberance crackling through the US economy before the crash. When its financing collapsed in 2008, the 3,800-room resort was left to languish two-thirds complete, the most glaring symbol of recession-battered Las Vegas. Mr Icahn bought it out of bankruptcy in 2010 for US$150 million. Last November, sensing the time was right, he put it on the market for US$650 million and the July negotiations were reported to be close to that price. It could cost another US$1 billion to complete and get it open, according to some estimates, but the very fact that there are interested investors draws a bold line under the city’s rebound. 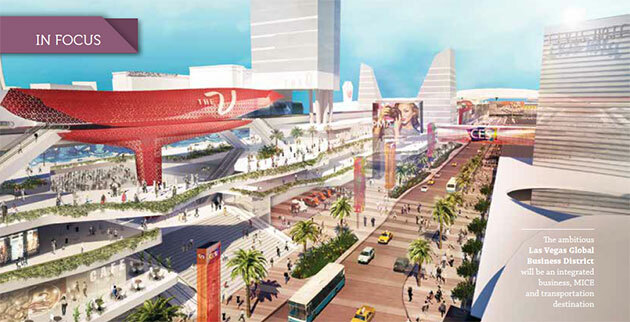 Less than a mile away, the Las Vegas Convention Center will sit at the hub of an integrated business, MICE and transportation destination – the Las Vegas Global Business District – that will be rising in phases westward from Paradise Road along a small street called Convention Center Drive that opens out practically at Resorts World’s front door. The Convention Center, the third-largest MICE facility in the United States, will grow by 1 million square feet of fresh exhibit space as part of US$1.4 billion worth of new construction aimed at positioning this vital piece of the Las Vegas resort mix to compete well into the 21st century. There will be new meetings, general session and pre-function spaces, a complete makeover of the technological infrastructure, new food and beverage outlets, landscaped public areas and more parking – all of it to be woven together and tied into the larger resort corridor via a network of road, light rail and pedestrian connections. The World Trade Centers Association, a global clearinghouse for trade and investment information, sees the project as a “defining moment” for the gaming mecca. “This overarching vision will be the next evolution of the trade show business in the destination and will launch Las Vegas 25 years ahead of the competition,” the group stated in a recent report. 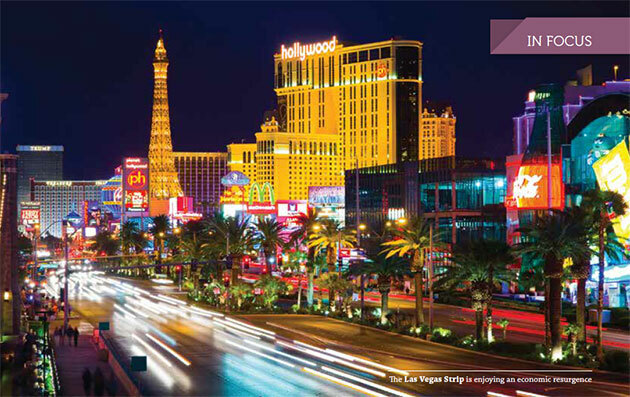 From Genting’s perspective the geography couldn’t be sweeter, says John Knott, who heads the Las Vegas-based Global Gaming Group of commercial property giant CBRE.